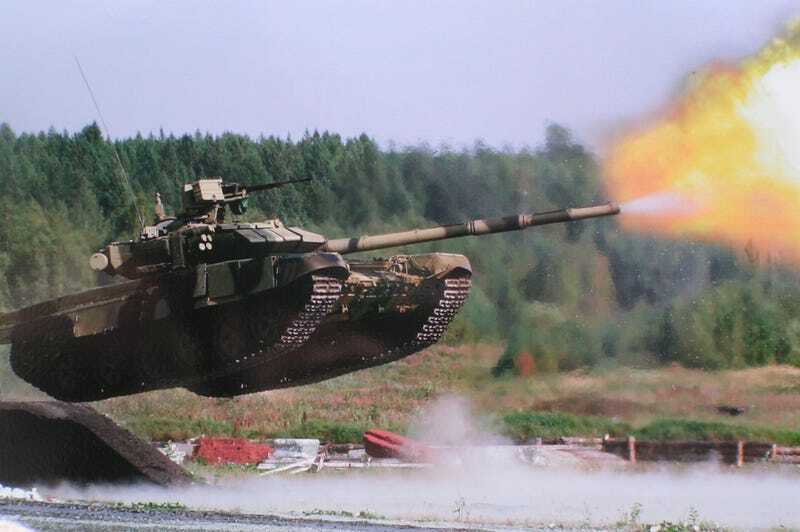 A Russian T-90AM tank firing its 125mm cannon as it flies off a ramp. Even after the fall of the Soviet Union, Russia still has more tanks than any other country in the world: 15,500. China and the USA follow with 9,150 and 8,325 respectively. Russia is now conducting its annual world tank championship. While the USA was invited to participate in the 2013 edition, this year there's no participation from NATO countries following the annexation of Crimea and the current war in Ukraine. Only Angola, Armenia, Belarus, China, India, Kazakhstan, Kuwait, Kyrgyzstan, Mongolia, Russia, Serbia and Venezuela are participating in the 2014 edition.